From the moment you step inside the front door of Sharon and Dave’s home, simplicity, elegance and cheerful colors will sweep you off your feet. 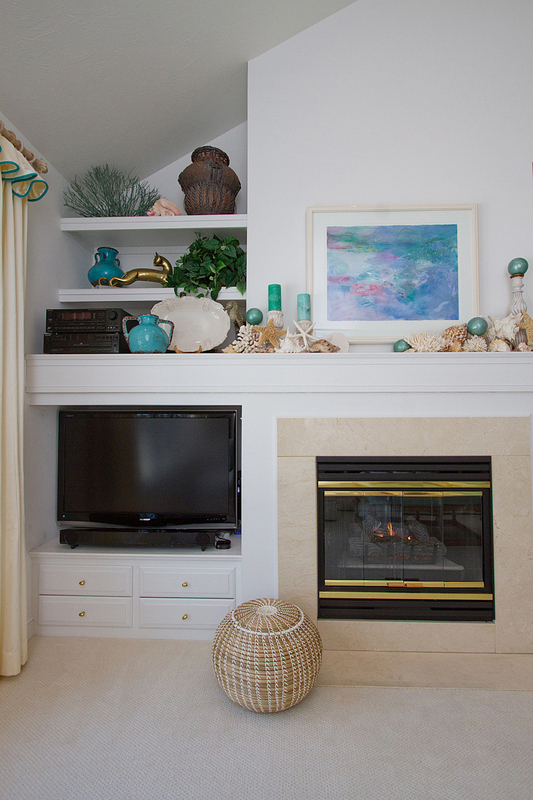 Springtime and Coastal accent colors dance around the Family Room and invite you to come in and stay awhile. Natural light pours in from the sky-lights on the heigh ceilings of the Living Room and the fireplace brings a natural coziness to the atmosphere. Sharon is living out her dream that she has had since she was 7 years old; her dream to be an interior designer. She is a woman of many talents and she shares them with the world around her. It’s so easy to fall in love with everything about their home: the atmosphere of care and love that fill each rooms, the bright happy colors that invade the space and the gentle touch and placement of small details in each room. But most importantly, the positive and loving spirit of Sharon herself. Sharon is a spokesperson for QVC, an interior designer, a member of ASID, and an author. You can see the love she pours into other’s lives just from being in her home. Sharon loves to support local artists. Since her wall palate is mostly white, she accents with beautiful and unique pieces of artwork and keepsakes; each one holding a story. And each piece fills her home with color and a cheerful vibe. Sharon’s style of Coastal and Country French greets you immediately at the door but follows you throughout the home and leaves such an impression, you’ll want to visit again and again. I want my home to be ordered in such a way that it reflects the beauty and depth of our Lord’s creation. I want it to be functional, provide safety and comfort and yet remain gracious enough to soothe the senses and inspire dreams. It’s been a twenty year relationship with my home and I am content with the results. My heart is happiest at the beach which is why the coastal theme prevails throughout. My mother was the youngest student accepted at the Cleveland Institute of Art. Her love of art was instilled in me. So it too, is an ongoing important character within my home. I believe there is always room for more. As a color specialist, I know that color is the second strongest emotional trigger; therefore, it is critical to our well-being. Just as with my design clients, I color printed my husband and myself, knowing that the palette chosen is one that both Dave and I thrive in. As a hyper-active being, I purposely chose the depth of hue for each room with a specific purpose. Now that you know a little bit about me, let me welcome you to my home . . . .
"I want my home to be ordered in such a way that it reflects the beauty and depth of our Lord’s creation. I want it to be functional, provide safety and comfort and yet remain gracious enough to soothe the senses and inspire dreams." The foyer introduces you to our world with a sensory of color and aesthetics and a wide open view to the center of our life – the family room. 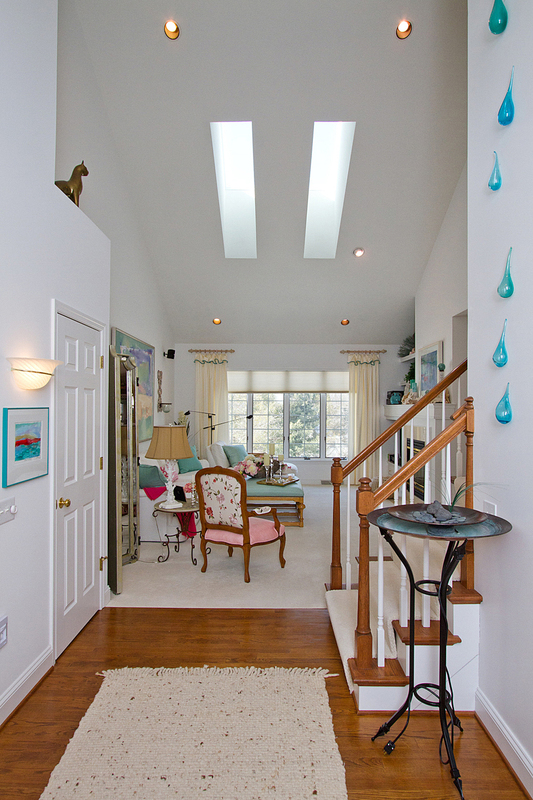 The glass raindrops on the right hand wall lead your eye up to the full height of the space while adding a whimsical expression of the ocean to our land-locked home. I love this perspective, because it encompasses the largest space within our home while expanding the view to the outdoors. Having a view to the outdoors is critical to our health as beings. So I have made every effort to bring the outdoors inside as much as possible in every room. The first piece I chose for this room was the ottoman. It was love at first sight. The turnings of the wood base and the soft patina of the wood complement the faux ostrich skin upholstery – in of course, my favorite color – sea foam. All white walls and nearly white carpeting created the perfect canvas for artwork. My dear friend Patty Rutherford created the large abstract painting specifically for this room. I love the way it evokes a playful mood while tying the colors together for the space. Open floor plans are wonderful, but it can be a challenge to encompass the full volume of the space into a more manageable focused perspective. Patty’s artwork was exactly the kind of anchor this room needed. One of my pet peeves about today’s culture is that the television has become the focal point in many rooms. I purposefully had the fireplace mantel extended to the left and added the built-ins to accommodate the television to allow the fireplace and artwork above to be the focal point of this wall. This is one of my most favorite details within our home. The painting gives a beautiful impression of the ocean while the shell collection completes the scene while enhancing our psychological and physical well-being with their reminder of the nature of the sea. Our little starfish performs an arabesque while balancing on the bed of shells. The candlestick was a gift from my hubby, Dave. It originally was a pair, but my sweetheart broke one while transporting them home. I love this candlestick even more because it is the only one. The ballet continues with a duo of starfish performing perfect arabesques. Candles and a sphere in the deep sea turquoise add just the right touch of color to this naturescape. I love that the fireplace is the focal point and not the television. The soft patina of marble is a wonderful compliment to the shells on the mantel. The natural woven reed ottoman adds a soft texture for contrast. I appreciate the beauty of French Country style, but I would be overwhelmed with a whole house of it. Instead, I chose this wonderful chair, the mirrored standing screen and the beautiful wrought iron table to create a vignette as a partner to our white sectional sofa. An open floor plan requires a continuous flow of color and theme. Otherwise it could create a disturbing sense that has the potential to insult the senses. The area rug (another of my passions) directs the way to the kitchen. On the far wall is an amazing scenic painted by an artist friend. Incredibly, it is one of the first touches I added to our home, nearly twenty years ago and yet, it is still a perfect expression of the total theme that has evolved over time. Welcome to the heart of our home. We love our kitchen. We live in our kitchen. It is where Dave and I begin each morning together and dine each evening. I love to cook and Dave is great at cleaning up – a perfect partnership. Here you see my love of Gustavian Swedish Country style. I love the grand size of this table: 60 x 60 inches which allows a lot of room for life, friends and family. I designed the bright coral/pink cabinet specifically for this space. By now, you see our love of nature. We are birders. Our yard is filled with many feeders that attract so many birds of multiple species. Our three cats have been carefully trained to stay away from the birds. I started collecting birdcages a few years ago and couldn’t resist hanging them in our kitchen on the wall opposite the scenic of a tree with hanging cages. The finishing touch is the Luminara® flameless candles that create a fabulous glow at night. A major kitchen renovation three years ago allowed me to build my dream kitchen. I love the white cabinets and the view from the window above my kitchen sink. Although not large, the kitchen layout is simply perfect for prepping and cooking. Continuing my palette of white allowed me to add yet another beautiful area rug as a foundation and spectacular pattern to the floor. Growing up as a child, we had glass cabinet doors. I love that they are back in style. By placing this glass door cabinet directly on top of the counter, it allowed me to make it deeper than standard wall hung cabinets. This was necessary because my cherished Italian made pottery dishes were too large to fit in a standard cabinet. From floor to ceiling, I love filling our home with color and art. By adding this shelf between cabinets above the window created the perfect place for more display of cherished items. This molding detail added a soft, curvaceous finish to the shelf. And it was so simple to do. I used stock molding from Omega National. The fabric for the little valance was chosen to pull the colors from the rug up to the window. I recently had a discussion with a design industry consultant on whether a tea pot was an accessory or an appliance. I laughed as I told her it was both! Here you see the contrast of simple subway tile on the backsplash with a single square of scraped quartz inset behind the stove. Note my shell encrusted turquoise vase on the countertop. Inside is yet another flameless candle to add that wonderful glow to this little kitchen corner. Ahh... That’s how I feel when I look at this picture. I love this little bench. It has been a treasure for nearly 30 years and to have it here in my kitchen makes my heart swell. Children and cats gravitate to it which I love. The painting is by my friend Victor who also painted the scenic on the wall. And just in case you haven’t yet noticed, I love decorative pillows. I have many and switch them out throughout the seasons. I have this theory about decorating “pass-through” rooms. These are rooms that we don’t actually live in, but simply visit or pass through occasionally throughout the day. I believe that can be a bit “over-the-top” to stimulate your viewing pleasure for the few moments you are there. So this is mine. I am thrilled with this wallpaper. 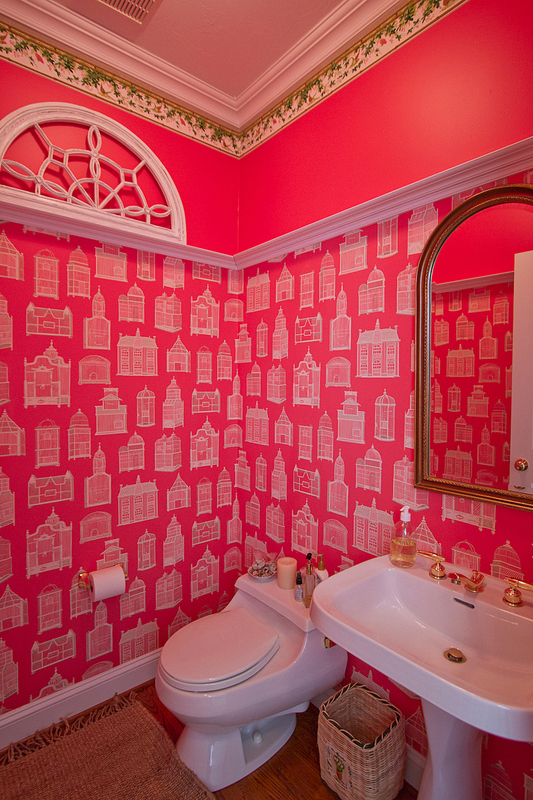 Thibaut® is one of my favorite wallpaper and fabric houses. I think they designed this paper with me in mind. My painter did an awesome job matching the background for the wall above. Because this was such a small and tall room, I brought it down to size by adding the molding turned on its side to become a little ledge. The faux half-round window frame was a gift from Dave. The bird/floral border added the perfect cap to the room. My dining room is just to the right off the foyer. The table is an antique Duncan Phyfe 60 inch round mahogany that I lovingly restored nearly thirty-five years ago. I still love it. This room is purposely colored in softer hues to invite your spirit to be at peace for dining. The Oriental rug was a challenge because of my desire for softer tones. I love the juxtaposition of the traditional carpet with contemporary art and buffet. Despite the fact that the first day of spring here in Pennsylvania brought snow, I was still hoping for a bit more warmth when I decorated my dining table with nearly blooming buds and bowel of spring colored spheres and flowers. Tabletop design is best when you follow the shape of a triangle. Since Dave is an antique dealer we are always out and about hunting for new old treasures. When we found this desk, I knew this little nook in the window of the dining room was going to be its home. A dear friend of mine has made me promise that if I ever want to get rid of it she wants it for her own dining room! How does this photo make you feel? I hope it brings you peace and calm because that was the intention. As I said earlier, I am hyperactive. I would never be able to fall asleep in a room popping with bright colors. So for me and Dave our bedroom is a true sanctuary. We love the daylight that streams into this room. The bed is our cats’ favorite napping place. Because the room is quite large with a high ceiling, our bed was chosen for its proportion so it would not be dwarfed in the space. We love this window with it gracefully arching top. In designing window treatments, it was critical to enhance that shape. The problem was that drapery rods do not come in arched shapes. So . . . we got creative and used PVC piping which we heated and bent to match the curve of the window. Then we painted them and antiqued them and added the beautiful finials. In keeping with the soft inviting feel of the room, we chose the white sheer, embroidered fabric for the draperies themselves. I think the overall effect came out wonderful. Our polydactyl footed Hadley. Just like Hemingway’s notorious Florida Keys kitties, Hadley has an extra toe. Hemingway’s first wife was named Hadley. Our Hadley is named after her, and an English male herb plant. Often you will find not just one – but all three kitties on the bed. Throughout the day, they rotate. This was Hadley’s lucky hour. Rudy is our oldest cat. He and Hadley both joined us the same day from Furever Home Pet Shelter. They were not exactly friends when we brought them home. The owner of Furever was almost certain we would be returning one of them. Not a chance. Within a few months I had them coming and sitting on command next to each other to receive their treats. Rudy’s little ear on the left is deformed. The vet thinks perhaps a sibling kitten nursed on it. Rudy is deaf is his other ear. As a result, Rudy is a very loud kitty. He speaks loudly so he can hear himself. He is the official “greeter” to those entering our home. Can you get any cuter than this? Our Jasper showed up at our home last winter. It was a brutally cold winter. When finding his owners failed, we started feeding him on our back porch. We taught him how to use the pet door on the screened in porch and placed a soft cuddly bed out there for him too. Over the summer, he got acquainted with the other two boys outside. When this winter rolled around, we decided to make Jasper part of our family and invited him inside. Every home deserves a place for books and cherished photos. I could not resist building these here in our bedroom. Although only 16 inches deep, they are abundant in space and are the perfect proportion for the vastness of space. When we wallpapered the bedroom, we wallpapered behind the shelves as well to create continuity. I love finding little items to decorate throughout out home. Though not expensive they provide the opportunity to add color and texture. I am always looking for unusual frames to place family photos to make them extra special. My books are wrapped to color correspond with scrapbooking paper. Stacked on the bookshelf they now are perfectly coordinated! We are fortunate to have such a large and light filled bathroom. Of course, my passion for rugs is once again on display. In fact, I have three rugs for this room that I change out throughout the year. I used a soft green small scale wallpaper to unify the space. Without it, the room just looked like a lot of broken up wall space. When we first moved in, the bathroom mirror although large was so plain that it looked unfinished. Using three inch wide molding we framed all around the mirror elevating it personality with a finishing touch. Brass is coming back! Yes, that’s right. The yellow toned metals are beginning to reappear. It was bound to happen – it’s been way too long gone. The look is softened by a tray of complementary metal topped perfume bottles. Our homes are the only environment over which we have control. Our homes should be our personal sanctuaries. For me the word “sanctuary” is synonymous with simplicity. My goal was to create a home that was not only practical for everyday living, but also vital to spiritual health. Building awareness of our spiritual selves and integrating that awareness into the way we live is important – it connects us and allows us to feel peace within ourselves. Inspiration: The wonder of nature especially the beach from dawn and the first wave as it laps the shore to the setting of the sun. Biggest Embarrassment: An interior Designer living with an Antique Dealer/Collector. I disdain clutter, Dave thrives on it. Biggest Indulgence: Area rugs, pillows and of course Original Artwork by local artists. Best Advice: Choose colors that make you smile -- it is the second strongest emotional trigger. If the colors in your home are correct for you than you will feel better each time you enter. I color print every family member and for whomever the room is most important - that is person whose colors I choose. Dream Sources: The Rug Company, Company C, Thibaut Wallcovering, Robert Allen Fabrics, and Local Artists and Craftsman. French Country Chair: Found at a decorator showroom in Philadelphia PA, custom leather and fabric from F.S. Schumacher.